Air Conditioner Maintenance St Louis - Book Your AC Tune Up! Air conditioner maintenance is very important to the life of your AC system, its efficiency, and to avoid common breakdowns that happen with ignored wear and tear. By cleaning and maintaining your air conditioner on an annual basis, you will help minimize your need for repairs. If you need immediate “AC maintenance near me,” call Hoffmann Brothers heating and cooling St Louis, Missouri at 314-664-3011 or request air conditioning maintenance on the form below. It’s important not to take chances with the hot St Louis summer heat. This seems obvious, but less so when it comes to the AC units we rely on each year. When AC maintenance gets forgotten, you could be looking at a breakdown, replacement and new AC installation that could have been avoided. It is recommended that you have a licensed air conditioning contractor perform the home AC maintenance services on your system each year before the heat of summer arrives. At Hoffmann Brothers, our trained central air conditioner maintenance contractors will work through an important AC maintenance checklist and always put safety first. Hoffmann Brothers offers a membership program where we come out on a semi-annual basis to provide air conditioner maintenance services. We will perform a full cleaning and tune up on your HVAC system so you get the very best home air conditioner maintenance in the St Louis area. To find out how you can become a Home Protection Plan member, call us today at (314) 664-3011. As a Home Protection Plan Member, you also get discounts off repairs across all of our services, free filters, discounts off of installation of heating, cooling, indoor air quality systems, and more! Hoffmann Brothers is the proud recipient of the 2019 Residential Contractors of the Year award from the ACCA. We’ve been serving the great people of St Louis for more than 40 years. We have a skilled air conditioner repairman ready to service your AC unit. We value your business and our licensed AC contractors will provide reliable AC maintenance for your home or business. 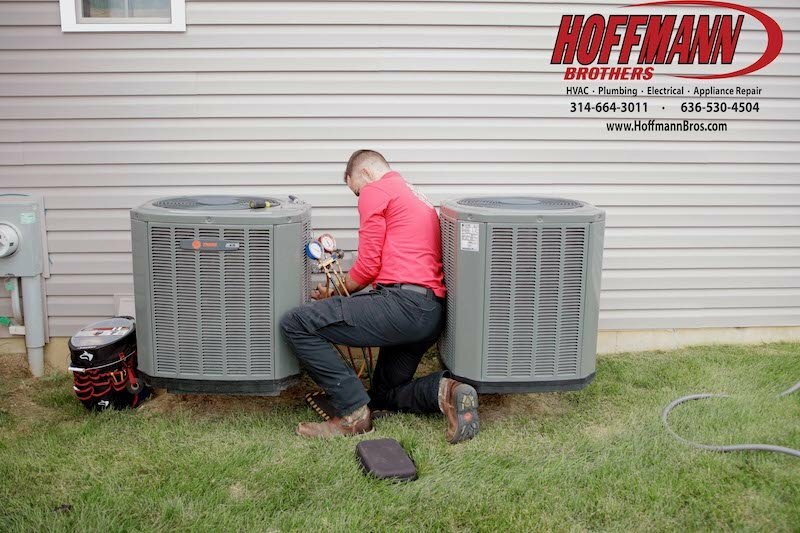 Don’t skip your AC unit maintenance or struggle through a hot St Louis summer before making your call to Hoffmann Brothers for air conditioning preventive maintenance. Schedule your air conditioner maintenance today at 314-664-3011 or request a maintenance appointment here.